T-14 Armata Main Battle Tank (MBT) is the latest Russian armament and arguably the world's deadliest armored fighting vehicle was on display at the Victory Day parade on Red Square, Moscow, in May 9, 2015. The Armata tanks will replace the oldest Russian tanks, like the T-72 and T-80, may also T 90 tanks to be outdated. 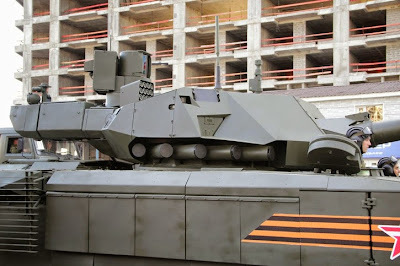 T-14 Armata tank project was very secret. This project was developed in 2011. 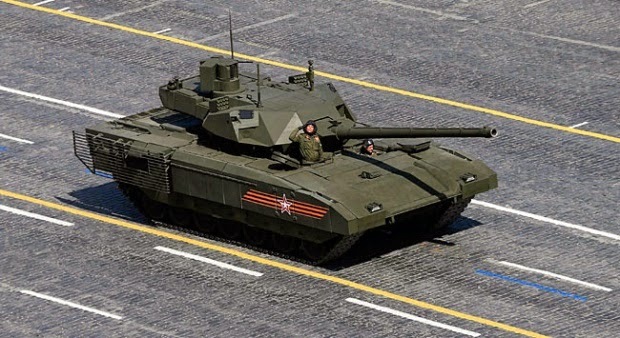 The Armata prototypes were made in 2013, and began the trial a year later. 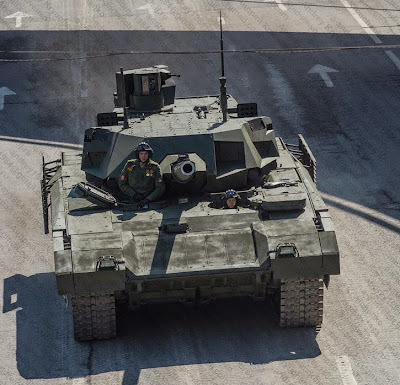 T-14 Armata was introduced to the public in early 2015 and exhibited at the Victory Day parade on May 9, 2015. The key feature of the new tank is its unmanned remotely-controlled turret, with crew members seated in an armored capsule at the front of the tank's hull. 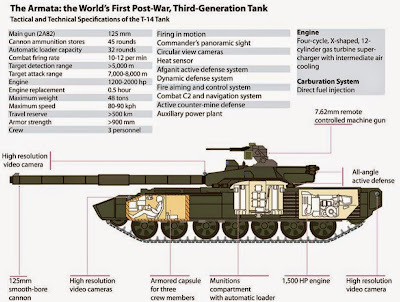 The T-14 is armed with a 125 mm smoothbore cannon that can fire high-powered munitions, including armor-piercing discarding sabot projectiles, guided missiles, shaped-charges and other types of munitions. And Armata use 2A82-1M, a latest-generation 125 mm cannon, with automatically shells re-load system and has 32 rounds of bullets ready for use. 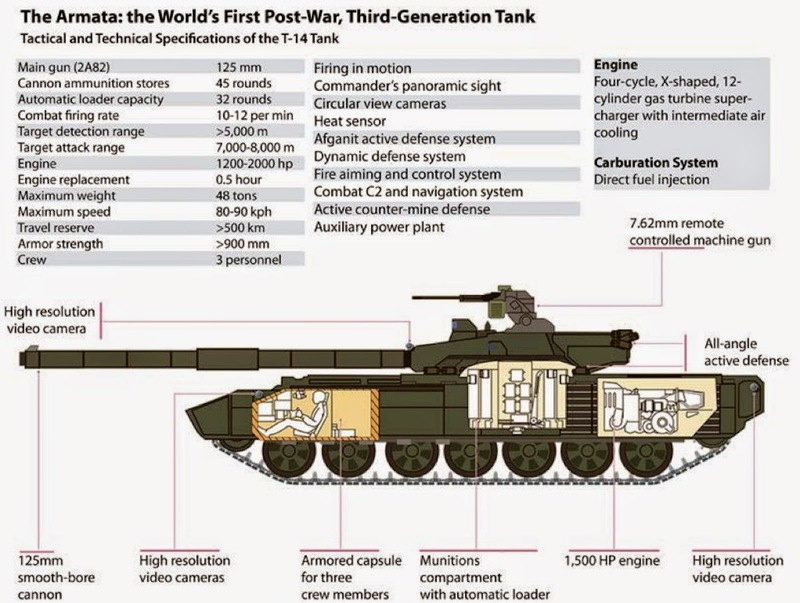 Overall, each Armata tank carries 45 rounds. The muzzle energy of the tank's cannon is greater than that of the German Leopard-2 Rheinmetall 120 mm gun, according to the Diplomat. 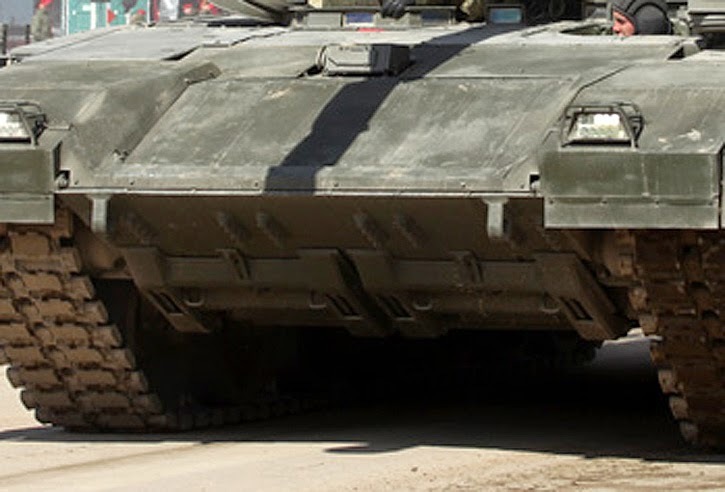 It is speculated that the Armata tank might also come with a 152 mm gun. If this is true, the tank will have the most powerful cannon ever mounted on a main battle tank. The T-14 will also carry a 30-mm sub-caliber gun to shoot down low-flying aerial targets, including planes and helicopters. To defend against incoming anti-tank missiles, the T-14 will have a 12.5 mm turret-mounted heavy machine gun. The Armata is literally a one tank army. The T-14 can defend itself from pretty much anything. Even the most modern Apache helicopter would not have a 100 percent chance of destroying the tank with its missiles, the US Foreign Military Studies Office (FSMO) said. Armata tank using a gas-turbine engine capable of generating power up to 1,500 hp, with a cruising range of 500 km. These tanks can drive 80 to 90 km/h on the highway. With this speed makes Armata can invade and destroy the enemy quickly. To finish all of that, the tank has fully automated ammunition loading and computerized targeting systems. Despite all the guns and computerized technology built into the armored vehicle, the menacing tank only needs two servicemen to operate it.